An acquaintance of mine, whose daughter was about to be married, decided to give her a diamond ring that had been in the family for several generations. The stone had never been appraised, so the father asked a gemologist friend if she would take a look at it. 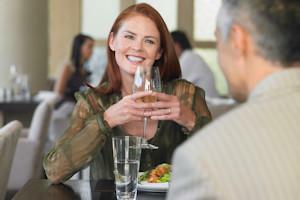 She agreed, but said that, instead of a fee she would accept lunch at one of Houston's finer restaurants. A few days later, as he and the gem expert sat sipping a glass of Chablis, he showed her the ring. She took out her jeweler's loupe, examined the diamond carefully and handed it back. "Wow," said a diner who had been watching from the next table. "These Texas women are tough!"